In the years following the pioneering work of HBT, the angular diameters of several more bright stars were successfully measured using this technique, yet it was eventually all but abandoned in astrophysics due to limited sensitivity. However, by taking advantage of modern technological developments in photonics and digital electronics, the authors of today’s paper demonstrate a renewed relevance of intensity interferometry, mainly for studying astronomical phenomena at sub-milliarcsecond angular resolution. The key technical requirement for performing stellar intensity interferometry is the ability to detect photon bunching with a sufficiently high signal-to-noise ratio. Bunching implies a positive correlation of the photon arrival times, which means that having detected a photon at some instant, it should be more likely to detect another photon immediately afterward than after some longer delay. This is the expected behavior of light received from an unresolved (spatially coherent) star, emitting thermal radiation. When comparing the arrival times of stellar photons received at two separate telescopes, the bunching signal should decrease with increasing telescope separation as the star is being gradually resolved, thus making it possible to infer the stellar radius or even detailed features of the stellar surface. Figure 1: The experimental setup (Fig. 1a from the paper): The blue part of the incoming light is diverted to a camera (CCD), for guiding the telescope. 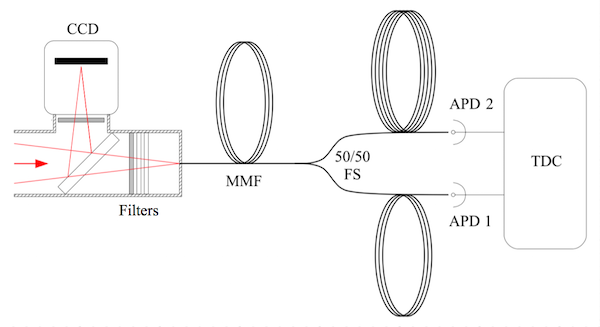 The red part passes through a polarizer and narrow bandwidth filters before it is injected into a multi-mode fiber (MMF) leading to a fiber splitter (FS). Two additional fibers connected to the splitter’s output ports then direct the remaining light to a pair of avalanche-photo-diodes (APDs), which send their signals to a time-to-digital controller (TDC). For a first test of their experimental setup (Fig. 1), the authors of today’s paper are using a single (1 meter) telescope only. The light collected by the telescope is focused and injected into an optical fiber, split, and directed onto a pair of photo-diodes. These produce electric pulses signaling the arrival times of photons to a time-to-digital converter, which lastly computes a correlation between the two diodes by counting the number of coincident detections in different time bins. To be able to measure a bunching signal in a reasonable amount of observing time, the electronics need to be fast enough, or the wavelength range of the selected light needs to be narrowed (to increase the coherence time). Figure 2: The intensity correlation function measured for three different stars (Fig. 3 from the paper). In all cases, the photon bunching peak is detected with a high signal-to-noise ratio (see text). After having conducted promising tests with artificial light sources, the authors successfully detect the photon bunching effect in observations of three bright stars (Arcturus, Procyon and Pollux) within a few hours of total exposure time, at a red wavelength suited to the spectral types of these stars (7900 angstroms). The predicted bunching peak is clearly visible in the measured correlation function (Fig. 2), and it has the height and width expected from the laboratory tests. Another main result is that the remaining measurement noise is limited only by the number of detected photons, so it could be reduced simply by continuing to observe for longer. In particular, the noise is unaffected by the effects of atmospheric turbulence. The authors conclude by proposing a number of possible improvements, which include making use of larger telescopes (and perhaps adaptive optics), faster photo-detectors and better electronics, as well as advanced methods of data processing. Already, their results suggest some exciting perspectives for future experiments. For instance, using a single telescope, intensity interferometry could be employed to study non-classical emission processes in astrophysical sources: laser sources show no photon bunching, and single-photon sources can show anti-bunching. The simplicity of the authors’ modernized HBT setup also offers a unique opportunity for high-resolution interferometric imaging, even at short, visible wavelengths, using multi-telescope arrays possibly extended over several kilometers. SPIE From the Perspective of a Non-Instrumentalist Planet or Brown Dwarf? How to Measure the Mass of a Companion You Can’t See (Not) Detecting Planets around Brown Dwarfs with Radio Waves A classic optics experiment, in space with asteroids and AGNs! The link at the top of the page doesnt lead to the correct paper. The link should work now – thanks!